Brighten your storefront with Stained Glass Inc. custom designs. Stained glass designs are a great way to add a splash of color and a touch of elegance to any retail location. You can easily enhance the visual appearance of your storefront, while avoiding the mess and chaos of construction, by having one of Stained Glass Inc.'s custom stained glass window inserts installed over existing windows. This process is quick and easy and will instantly boost the look and mood of your store. If you really want to make a statement, install a large stained glass sign, with a custom name or logo over your checkout counter. 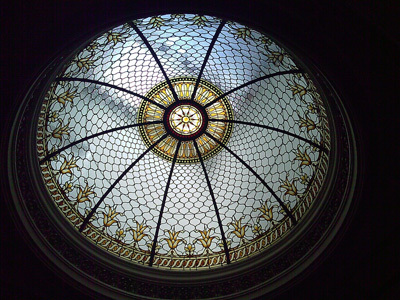 Another beautiful addition could be a stained glass ceiling or dome. These attention grabbing designs will not only add to your store's overall aesthetics, they will also help guide customers to the register. Please call to speak with a stained glass design consultant about custom designed windows just for you. We will help you transform your dream into reality.